Welcome back Cutting Edge Stencil friends. Ever craved a bold accent wall but didn’t know where to start? Well, we have a unique but fun DIY stencil project that’s sure to satisfy. Let’s get stenciling! 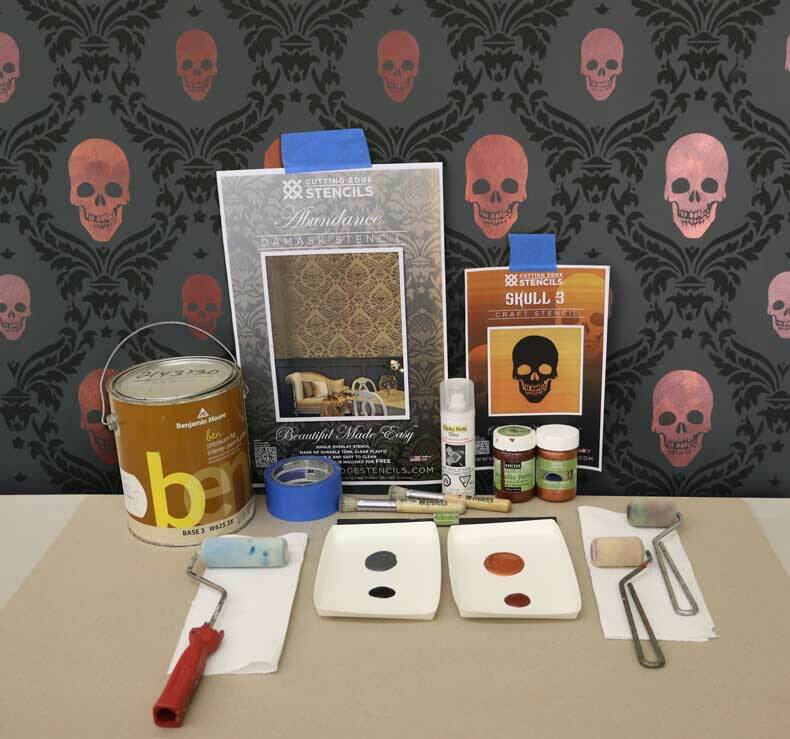 The stencils used for this spooky DIY project are the Abundance Damask Stencil and the Skull Stencil #3. The paints used for the base coat and Damask stencil are Benjamin Moore Ashland Slate and Black. The paints used for the skulls are Modern Masters Plum and Copper. 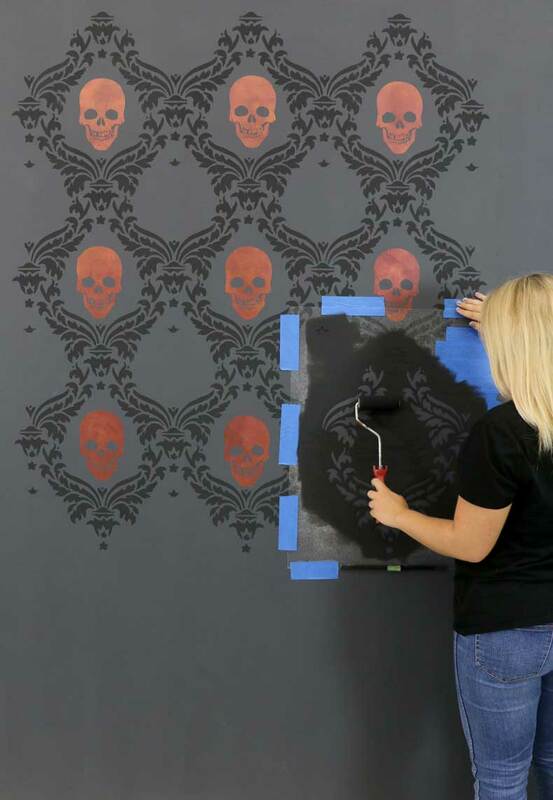 We suggest using a 4” stencil roller for the damask portion of this project and a 2” stencil roller for the skulls. 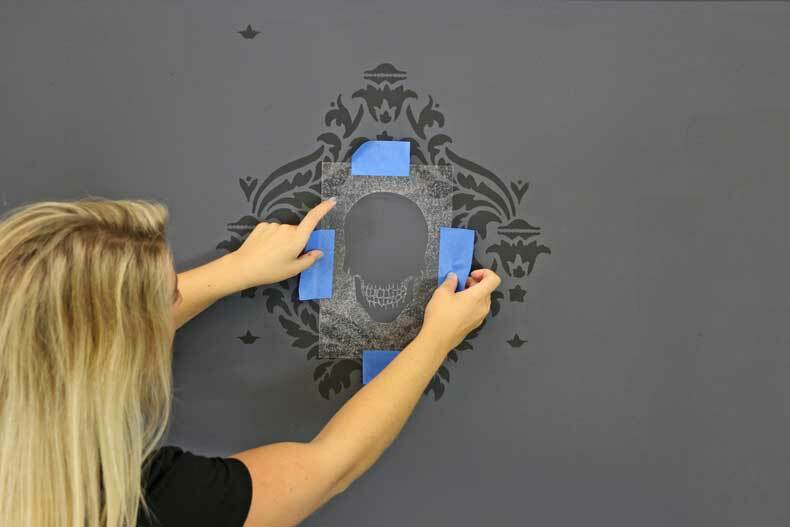 Since the nose and eyes of the skull stencil are small, we suggest using a professional stencil brush for these sections. 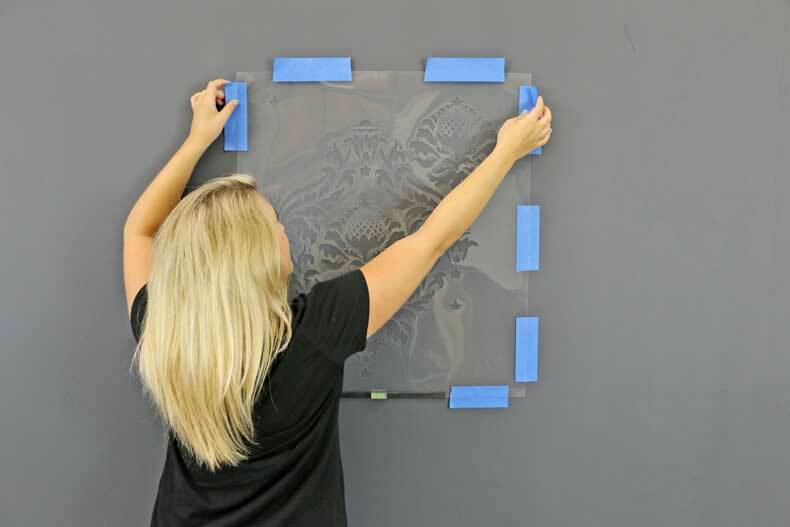 Place your clip-on stencil level at the bottom of your stencil. This little tool is so helpful to make sure your stencil rows are straight every time! 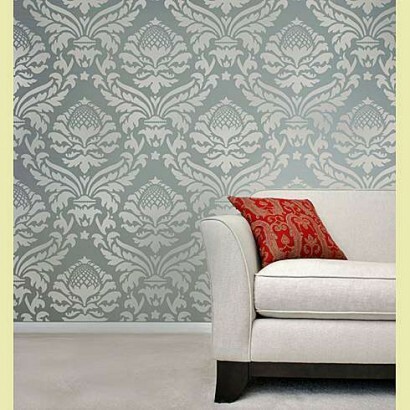 Place your damask stencil to start. 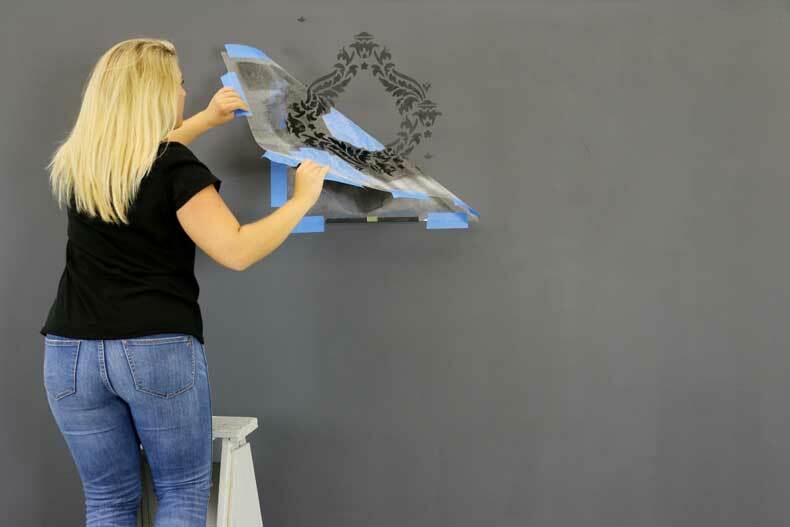 You can use blue painter’s tape to help secure the stencil to your wall. Tape off the sections of your damask that you aren’t going to use. We taped off the middle and the upper right corner of the stencil. Stencil the remaining portions with your 4” stencil roller and black paint. 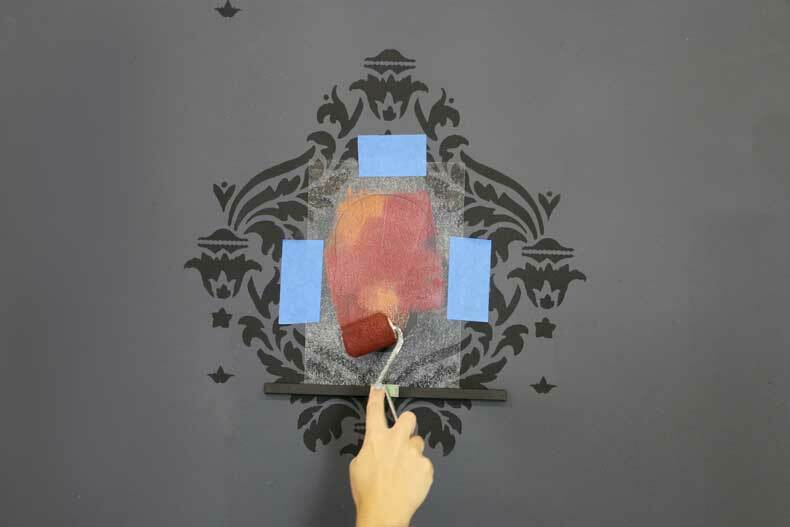 Make sure to offload any excess paint from your stencil roller onto a paper towel before stenciling the wall. This helps reduce paint from seeping underneath the stencil. The number one mistake when stenciling is having too much paint on your stencil brush or roller! 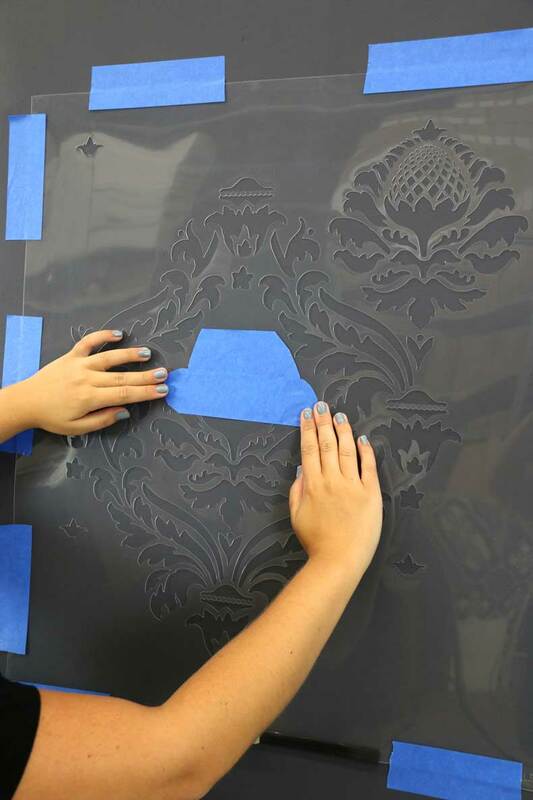 Peel back the stencil to reveal this damask design. So easy, right? 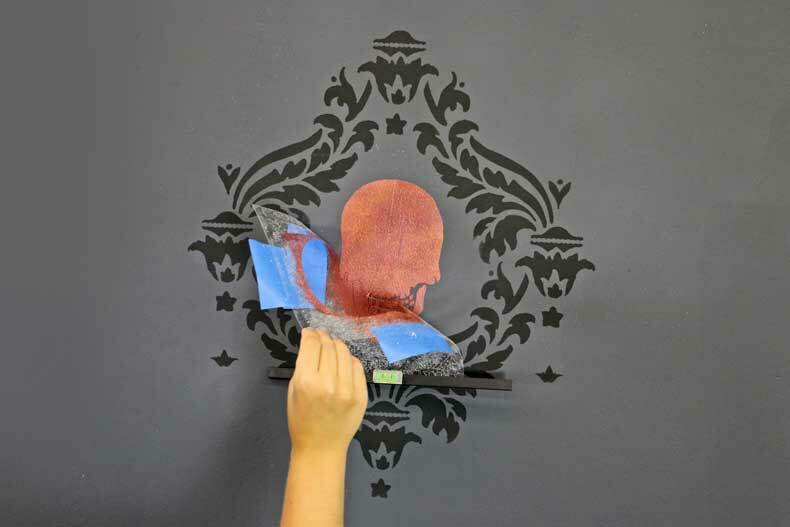 Next, detach the overlay portion (eyes and nose) of your Skull Stencil #3 and place the remaining part of the stencil in the center of your Damask. 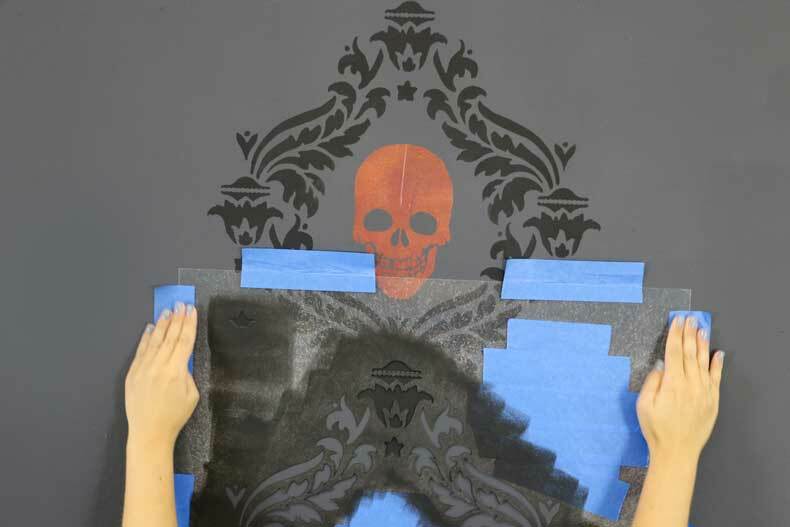 You can use a stencil level for this stencil as well to make sure all the skulls are straight! 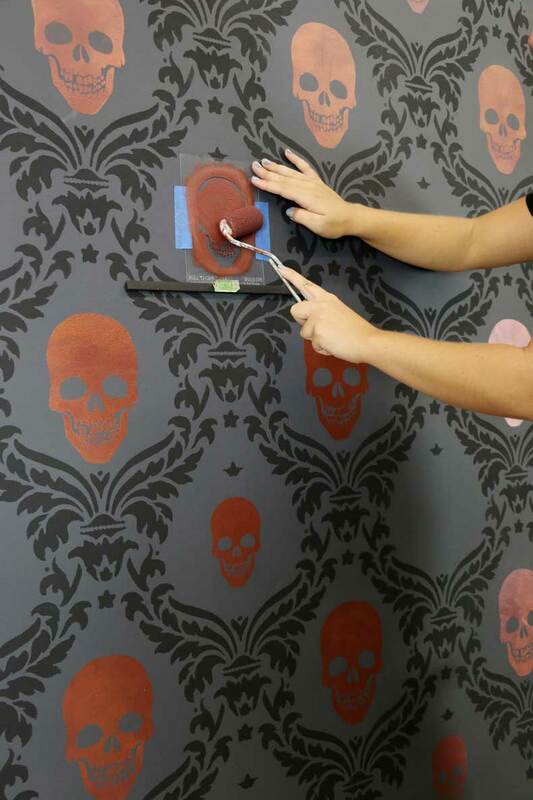 With your 2” stencil roller, apply your metallic orange and red colors at the same time to the skull. 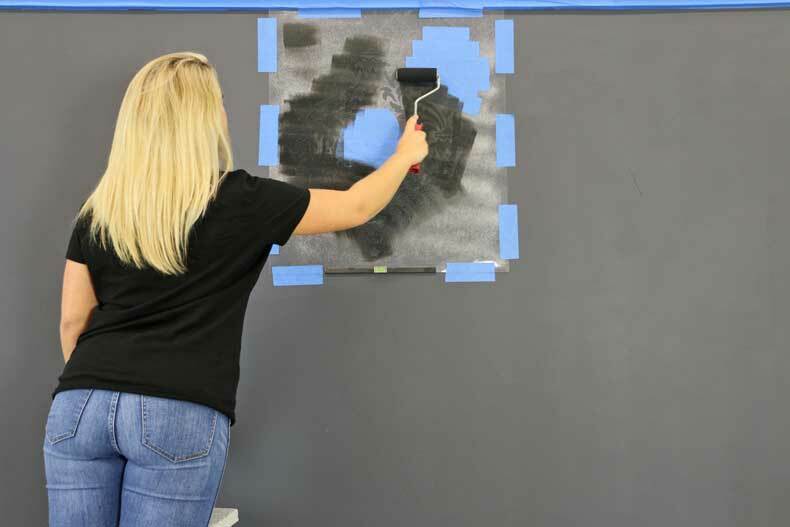 Make sure to blend the colors together with your stencil roller for a seamless finish. 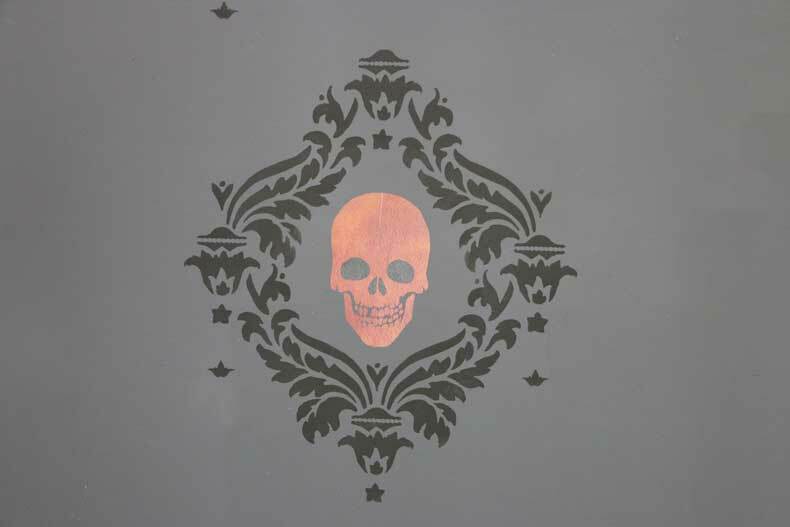 Peel back your stencil to reveal this beautiful metallic skull. Don’t the colors complement each other perfectly? Place the overlay section of the stencil on top of your skull. 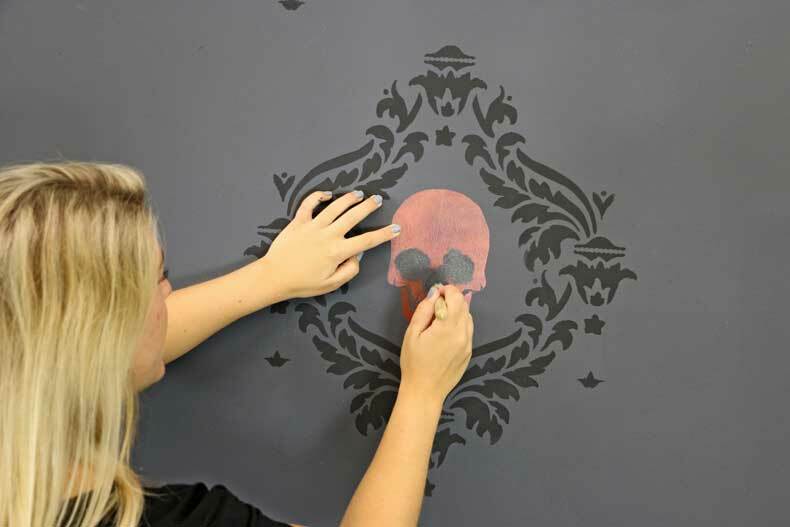 Stencil in the skull’s eyes with a professional stencil brush and the color of your wall. 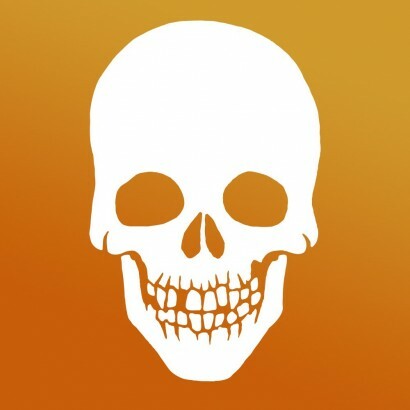 This will make it seem as if the skull’s eyes and nose are transparent. Cool, right? 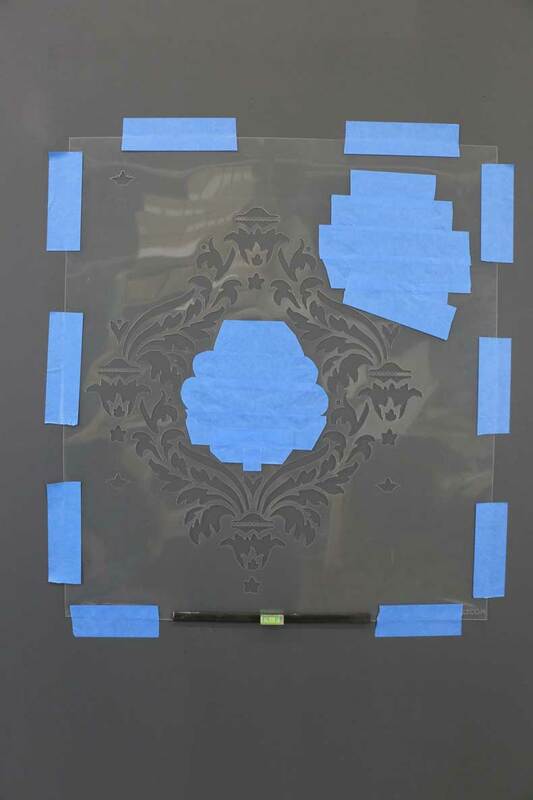 Align the Damask stencil with the previously stenciled portions. This registration system makes stenciling effortlessly easy! 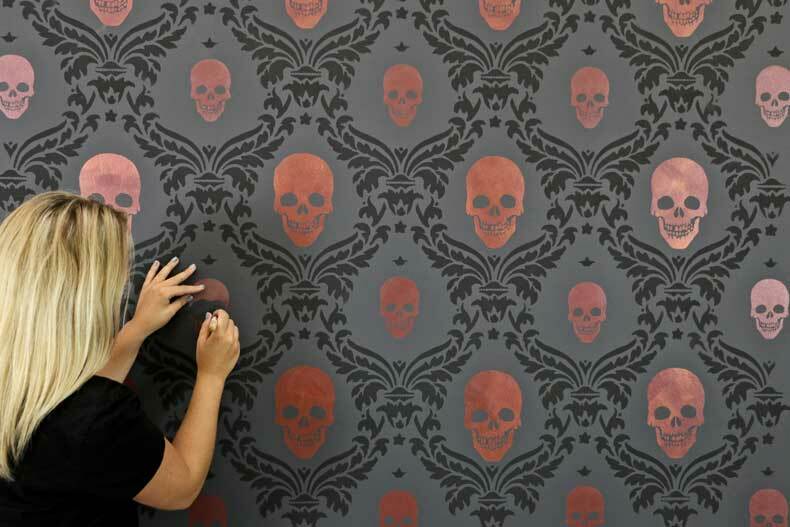 Repeat the process until you wall is full of stunning skulls! 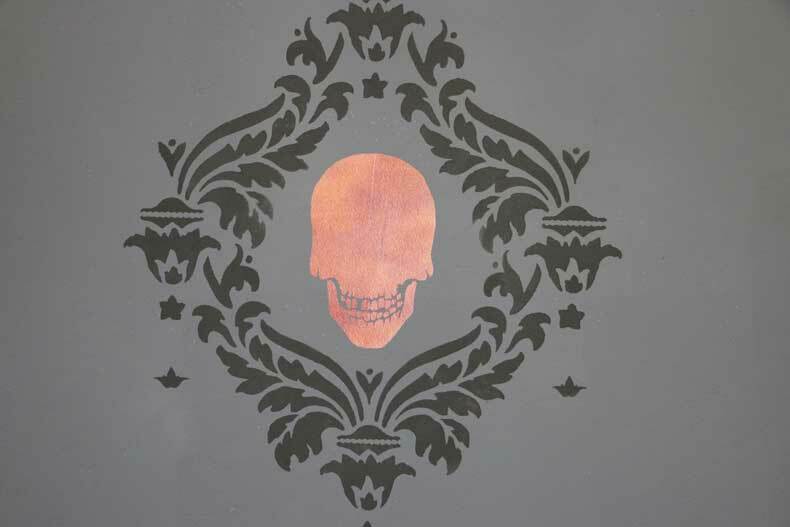 Because there was a section of the Damask design masked off there is now an empty space in between some of the skulls. 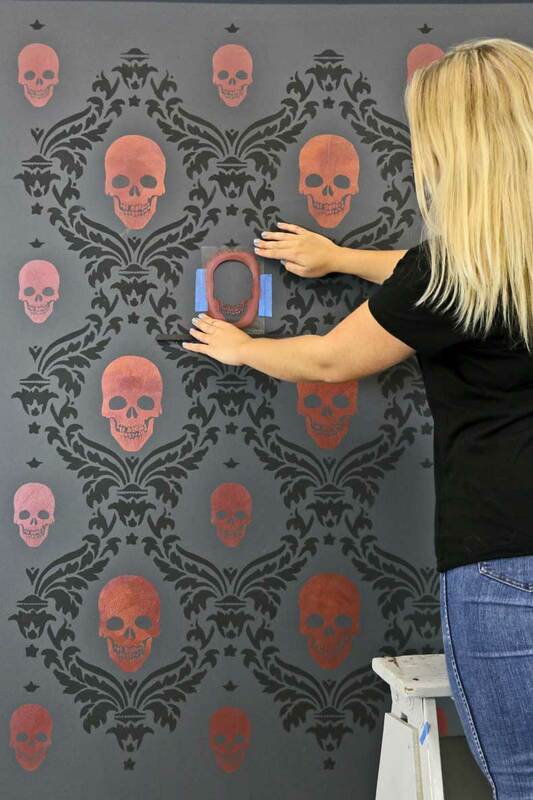 You can totally leave the wall like this or fill in the gaps with a smaller Skull Stencil #3. 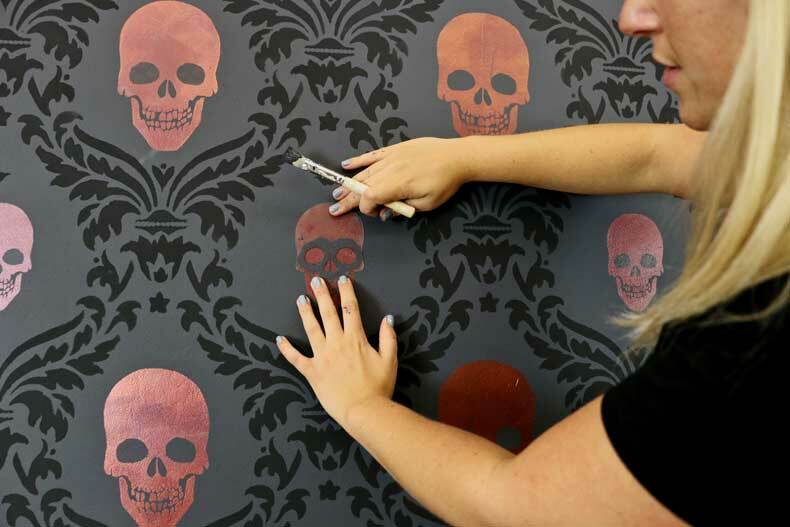 Simply, follow the same process as the larger stenciled skulls! 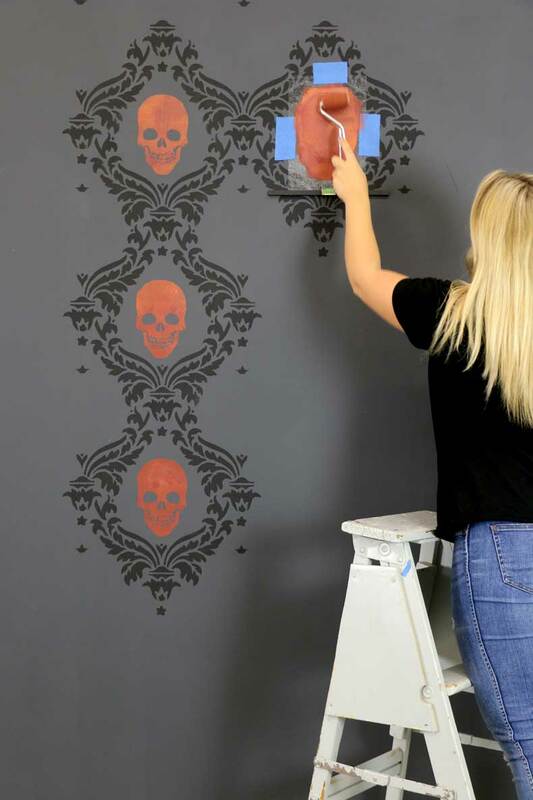 Continue to stencil your mini skulls until your spooky accent wall is complete! 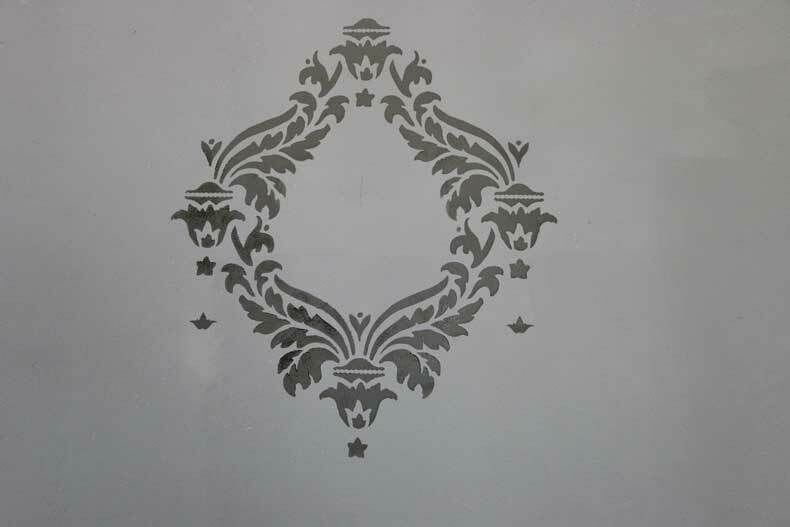 Check out our Cutting Edge Stencils Facebook Page to see our beautiful customer photos and interact with the people who created them. 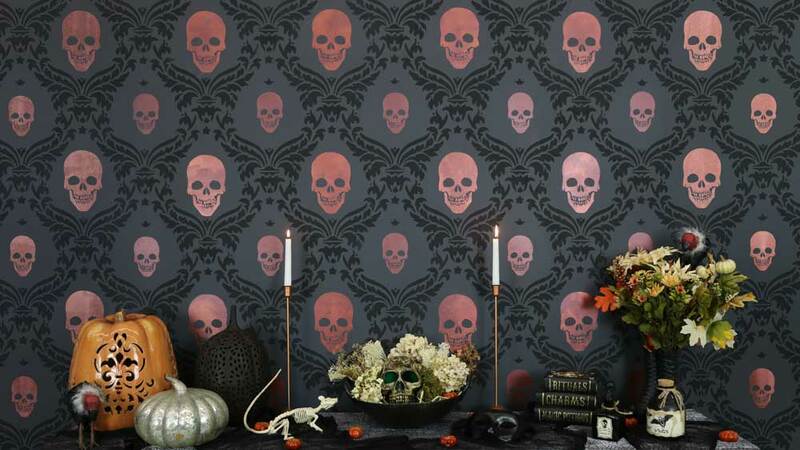 Buy our Halloween Stencils or for your next stencil project, and browse our other wonderful stencil designs. Follow us on Instagram and Pinterest and share your designs using #CuttingEdgeStencils. We love seeing your projects! Thanks for reading and happy stenciling! Feeling the Chevron Stencil Stripe Hype?